I am sitting in my warm, small house today watching a blizzard outside my window. It is bitterly cold and getting colder. High of MINUS 4 degrees by tomorrow and even lower Wednesday. 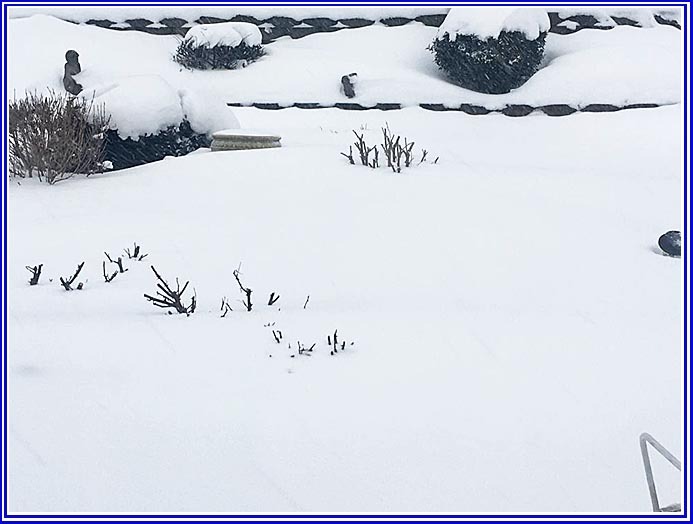 My beautiful back-yard rose garden has disappeared beneath the snow, my rose bushes trimmed and in a complete sleep for the winter. It is snowing so hard I can’t even see across the street at times. Thank God we have our electricity, including a heated throw on the couch and an electric blanket on my bed. I usually blog about writing advice, but today I am thinking about the small, odd things that comfort us at times. Things like appreciating being inside a warm house and looking out the window at snow … and thinking about how nice it will be to walk outside and enjoy a cup of coffee in my rose garden come spring … how pretty things will be when the snow is gone and the grass is green and the roses are red and birds are making a lot of noise in our pine trees and will flit past me and perch on the bird bath or flutter around the bird feeders. 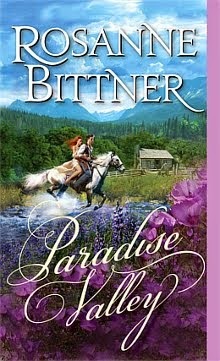 I’ll watch the baby bunnies hop around in my garden and nibble at the petunias I will set out just for them. I appreciate the hot cup of coffee or cocoa I sip on while watching blizzard winds outside my kitchen window. I appreciate my health and the fact that I am still physically and mentally healthy enough to sit here and work on my 71st book (which is the second book in my “Outlaw Trail” series). I appreciate that my freezer and a cabinet in the garage are filled with plenty of food. I could be stuck here for two weeks and never go hungry. I can connect with friends via the internet and cell phone, and I can call 9-1-1 if I have an emergency. We do have wonderful ways of staying alive and healthy nowadays … and the TV still works, so I can watch my westerns! Hubby is home and safe with me, and that’s something to be grateful for … and if we absolutely must go out in the blizzard beyond the window, we both have 4 WD vehicles – hubby a Ram truck, and me a Jeep Grand Cherokee – so we can get out if we have no choice. I call this “Jeep Challenge” weather, and it is actually a lot of fun barreling through deep snow in my Jeep and not worrying about getting stuck. It is so “white” out that you can barely tell where the driveway really is under all that snow, or even tell where the road is. The big county plow trucks go thundering past and spew deep chunks of snow over the end of our driveway, where we only recently had all that snow plowed away. It’s a never-ending process of shoveling, plowing, watching it pile up again, then shoveling and plowing again. Meantime, I can always bake a pie or some bread just to warm up the house with welcoming smells. 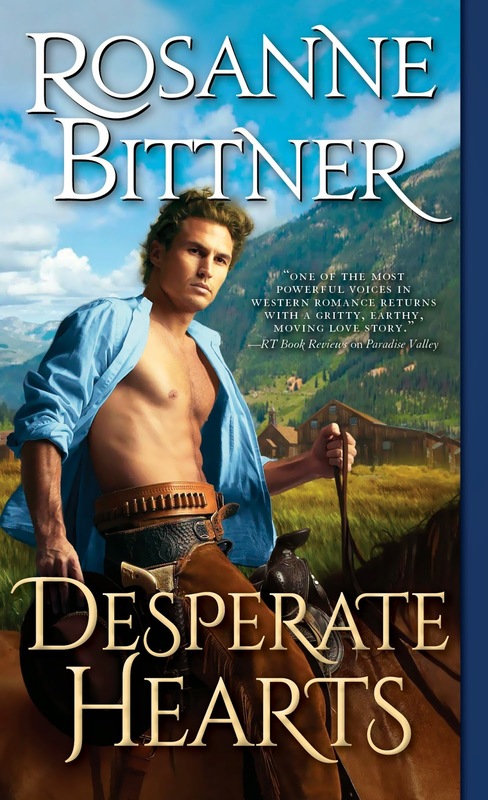 Oddly enough, I even take comfort in thinking about some of my books, and how the pioneers struggled in times like these, with no communication to the outside world and no medical help in an emergency. They tied ropes from the house to the sheds and barn and even to the out-house so a “white-out” blizzard wouldn’t keep them from finding a certain building or from getting lost on a return from the barn. I think about the strong, sure men I write about, who knew how to survive and how to protect their families from the weather or from outlaws and Indians and grizzlies. And there is always my music. I can put on my ear phones and listen to my “mood music,” which I use for my writing. My music can take me right to where I want to be – out West on the wild prairie, the grassy plains, the Rocky Mountains, where the wind whistles through canyons or where water splashes down those mountains into wild rapids that rush through high-walled canyons. Hubby is home today, so we have each other in case of an emergency … as well as having each other to cuddle with against the weather. After 53 years of marriage, we know each other’s every thought and need, and that’s a comfort, too. My biggest comfort is knowing I have so many fans out there beyond this Michigan snowstorm who might be hunkering down against their own bad weather with one of my books – something to keep them busy and to remove them from what’s going on outside and help them while away the time until better weather gives them reason to get up and go outside and enjoy the sun again. I hope everybody stays warm and comfortable the rest of the winter. 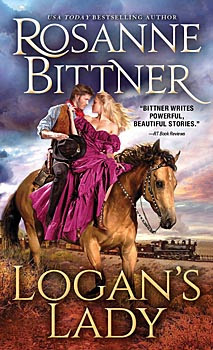 By spring (March 26th to be exact), you will have a brand-new Bittner book to read – LOGAN’S LADY! (Sourcebooks) It’s already available for pre-order on Amazon, so that gives you even more to look forward to as trees begin to bud again and the grass begins to get greener again. Check my web site for more new books coming in 2019! 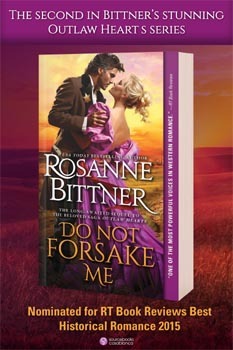 www.rosannebittner.com. A “cozy” winter to all of you!